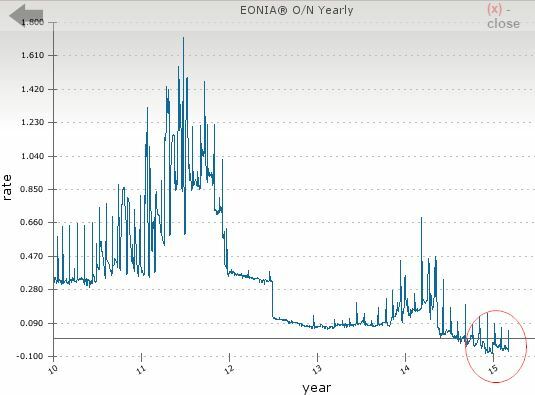 In 2011, as the sovereign debt crisis engulfed the Eurozone, the EUR/USD swap basis was deep in the negative territory (see 2011 post). It was caused to a large extent by US money market funds who refused to roll dollar-denominated commercial paper issued by European banks. Just as the Lehman commercial paper exposure turned toxic for money market funds in 2008, so was the Eurozone bank exposure in 2011. In late 2011, with limited ability to fund dollar assets on their balance sheets and no access to dollar deposits, many Eurozone banks turned to the foreign exchange markets. Given their access to euros (via deposits or loans from the ECB), banks converted euros to dollars and used the basis swap market to hedge their FX exposure. That demand for EUR/USD swaps pushed the basis into negative territory. The ECB's currency swap with the Fed alleviated some of the stress by allowing the ECB to lend dollars directly to the euro area banks. Now the EUR/USD basis swap has turned negative again and some have suggested that the funding pressure on Eurozone banks is back. But that's not at all the case. The culprit this time around is the areas demand for yield. Eurozone banks can now access euros at negative rates (chart below) and are willing to pay up on the basis swap to obtain dollar funding - in order to access better yielding dollar assets (USD bonds and loans). Moreover, higher-rated US corporations have been actively issuing euro-denominated bonds this year as the demand for quality bonds spikes in response to ECB's QE. These US firms then convert the proceeds from the bond sales to dollars in order to fund US operations. 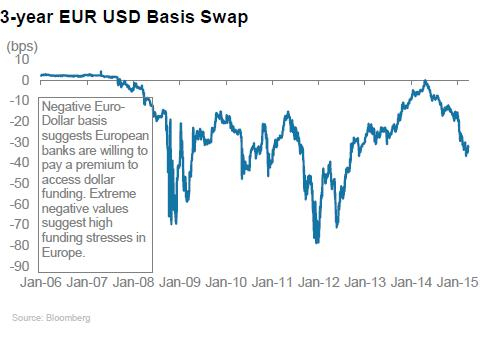 But since they will need to repay euros in the future, they hedge themselves with EUR/USD basis swaps. That puts further downward pressure on the basis. Demand for dollar funding in the Eurozone is likely to remain elevated, as the area provides extraordinarily cheap financing while access to quality fixed income product has become increasingly limited.